Born a Visigoth, the son of Aigul, Count of Maguelone. Educated at the court of Pepin. Courtier and cup-bearer to King Pepin and Blessed Charlemagne. Part of the 773 campaign of Charlemagne. Narrowly escaped drowning in the Tesin near Pavia, Italy while trying to save his brother. Benedictine monk at Saint Sequanus monastery where he took the name Benedict. Lived two and one half years on bread and water, sleeping on the bare ground, praying through the night, and going barefoot. In the Frankish empire, monasticism suffered lay ownership and the attacks of the Vikings. Monastic discipline decayed. In 779 Benedict founded the Aniane monastery on his own land; the monks did manual labor, copied manuscripts, lived on bread and water except on Sundays and great feast days when they added wine or milk, if they received any in alms. The results of his austere rule were disappointing, so he adopted the Benedictine Rule, and the monastery grew. 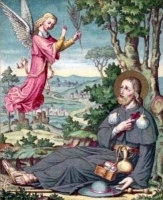 He then reformed and inaugurated other houses; Saint Ardo travelled with him and served as his secretary. Bishop Felix of Urgel proposed that Christ was not the natural, but only the adoptive son of God (Adoptionism); Benedict opposed this heresy, wrote against it, and assisted in the Synod of Frankfurt in 794. 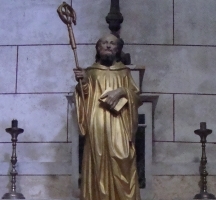 Emperor Louis the Pious built the abbey of Maurmunster as a model abbey for Benedict in Alsace, France, and then Cornelimunster near Aachen, Germany, then made Benedict director of all the monasteries in the empire. The monk instituted widespread reforms, though because of opposition they were not as drastic as he had wanted. Participated in the synods in Aachen. Benedict was an advisor and supported of the emperor. Wrote the Capitulare monasticum, a systematization of the Benedictine Rule as the rule for all monks in the empire. Compiled the Codex regularum, a collection of all monastic regulations, and Concordia regularum, showing the resemblance of Benedict's rule to those of other monastic leaders. The rules stressed individual poverty and chastity with obedience to a properly constituted abbot, himself a monk. Benedict insisted upon the liturgical character of monastic life, including a daily Conventual Mass and additions to the Divine Office. He stressed the clerical element in monasticism which led to the development of teaching and writing as opposed to manual labor in the field. This direction lapsed some after Benedict's death, but had lasting effects on Western monasticism. Benedict is considered the restorer of Western monasticism and is often called "the second Benedict". Noble layman; friend and counselor to the king, he was married to a wealthy widow. A stag he was hunting predicted he would kill his own parents. Julian moved far away to avoid his parents, but they found him, and came to make a surprise visit. His wife gave them her and Julian's bed; Julian killed them, thinking they were his wife and another man. As penance, he and his wife travelled to Rome, Italy as pilgrims seeking absolution. On his way home, to continue his penance, Julian built a hospice beside a river, cared for the poor and sick, and rowed travellers across the river for free. Once, after having helped many, many travellers, Julian gave his own bed to a pilgrim leper who had nearly frozen to death. When they had him safely settled, the man suddenly revealed himself to be an angel. The visitor announced that Christ had accepted Julian's penance; the angel then disappeared. Immensely popular in times past; scholars today think the story is likely to be pious fiction, mistaken for history. Sanctified virgin, the forerunner of professed nun. Martyred at age 13 or 14 in the persecutions of Diocletian. 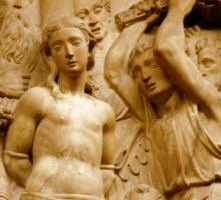 Often confused with Saint Eulalia of Merida. Several villages in Guienne and Languedoc are named for her. Born to a wealthy and prominent family. Bishop of Sebaste, Armenia (modern Sivas, Turkey) in 358 following the deposing of an Arian bishop. The Arian priests revolted, and forced Meletius into exile. Chosen bishop of Antioch, Syria after that city's Arian bishop had re-located to Constantinople. The Arians in the diocese revolted, and Meletius was exiled three times, returning in 362, 367 and 378. Supported by Saint Basil of Caesarea while in exile. In 379 he called a council at Antioch to formally install orthodox Nicene Christianity as the proper profession of the faith. Baptized and ordained Saint John Chrysostom; consecrated Saint Gregory of Nazianus as bishop of Constantinople in 381. Youngest son of Evan and Helen Haydock. Educated at the English College in Douai, France, and the English College in Rome, Italy. Ordained on 21 December 1581 at Rheims, France. He then returned to England to minister to covert Catholics during the persecutions of Queen Elizabeth I. Arrested in London, England, he served 15 months in the Tower of London for the crime of being a priest; at one point he was finally allowed to administer the Sacraments to fellow prisoners. Zealous supporter of the pope, and not secular authorities, as ruler of the Church. Martyr. Born to the Scottish nobility, the son of Itiboldo. Used his inheritence to build a hospital for the poor, a hospice for pilgrims. Died while returning from pilgrimage to the tombs of the Apostles. 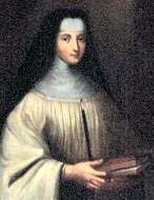 Younger sister of Saint Bernard of Clairvaux. Married to Guy de Narcy, a member of the ruling family of Lorraine (in modern France). After a few years of rich and frivolous living, Humbeline turned her back on the worldly life; after a few more years she, with her husband's approval, became a Benedictine nun at Jully-les-Nonnains convent near Troyes, France. Served as abbess there. Born to the Italian nobility. Benedictine monk in 1006 at the San Solutore Abbey near Turin, Italy soon after its founding. Reluctant abbot in of the house in 1031, he served the remaining 22 years of his life. Born to a noble family from Phrygia who had moved to the country to escape persecution by the iconoclasts. Monk near Constantinople at age 12. Abbot of his house. Patriarch of Constantinople in 893. He worked to heal the schisms created by his predecessor Photius, presiding over the Fourth Æcumenical Council of Constantinople in 869 and 870 which condemned or reversed all that Photius had done; all records of the council were destroyed by later schismatics. Throughout his life Antony was known for his personal holiness, his deep personal prayer life, and the sanctity he brought to his offices. Studied at the Pontifical Seminary of Shkodrë, Albania. Ordained on 19 May 1915 as a priest of the archdiocese of Shkodrë-Pult, Albania. Imprisoned and tortured to death in the anti–Christian persecutions of the Albanian Communist government. Martyr. Educated at Corpus Christi College and Gloucester Hall at Oxford University. Married layman and schoolmaster. Widower. He studied at Rheims, France, and was ordained in 1580. He returned to England to minister to covert Catholics in the area of Somerset. Arrested for his faith, he was convicted of treason when he remained loyal to Rome and refused to take the Oath of Supremacy. Martyr. Educated at Oxford, England. Convert to Catholicism. Seminarian at the English College in Rome, Italy; ordained in 1583. He returned to England to minister to covert Catholics during the persecutions of Queen Elizabeth I. Arrested and executed for the crime of being a priest. Martyr. Joined the Augustinians as a young man. Feeling a need to devote himself to God, he wanted to "go where no one knew him except God alone", and he withdrew for a while to live as a hermit in prayer and penance in the province of Portugal. Missionary to the island of San Thomé, in the East Indies. Studied at New College, Oxford. Teacher and schoolmaster. Studied for the priesthood at Rheims, France, and Rome, Italy. Ordained in 1582. Martyr. Benedictine monk of Santa Maria dei Fonti, Italy. Hermit on the island of Gallinaria in the Gulf of Genoa, Italy. Bishop of Albenga, Italy in 870. Brother of Blessed Robert Nutter. Fellow at Saint John's College, Cambridge. Studied for the priesthood at the English College in Rheims, France. Ordained in 1581. Martyr. Seminarian of the archdiocese of Tarragona, Spain. Martyred in the Spanish Civil War. Wrote the epic poem Carmen Paschale. He left Ireland to found a school of poetry in Athens. May have been a disciple of Saint Ailbhe. In 494, a decree of the First Roman Council contained a phrase "honoring by signal praise the Paschal Work of the Venerable man, Sedulius". Russian nobleman who gave up his worldly position to become a Basilian monk. Archbishop of Kiev. Well educated, but he was more known for his spiritual wisdom; even the Sultan of the Turks in Asia Minor sought his advice. Franciscan friar. Betrayed by a heretic monk, he and several of his religious brothers were martyred by order of King Bazarath.